Every International Peoples Project (IPP) is different. Project themes are developed by responding to an identified need within a community, and run in partnership with a local organization. Malmo-Lund, Sweden. 1 to 18 July 2019. Participants in this IPP will consider how to create a space or community with a high feeling of safety. In cooperation with a partner organization specialising in youth development and empowerment, participants will create a short term project demonstrating that a small actions can make a great impact. The participants will work closely with local youths to create a cultural exhibition about the theme of safety. Fryshuset, the IPP partner, works to enable young people to change the world through their passions. They listen to, work and build relationships with young people and together create venues where young people can be seen, heard and counted. Together with the partner, participants will explore and problematize the themes of safety in the immediate physical environment. Through activities and examples brought from their own countries, workshops with local organisations in the society, and other activities relating to the theme of safety, they will develop their understanding of how safety can be perceived differently and can be created through different means. Be willing to communicate across language barriers. Be open to working with people of different background. Be interested in working towards a safer environment. Be willing to prepare an activity sharing a perspective or example of the theme from their own country or community. Prague, Czech Republic. 13 to 27 July 2019. This IPP follows the success of the 2017’s ‘Inclusive Communities’, where participants and residents alike reported the experience as being an eye-opening and transforming moment of their life. Participants will join residents living with Multiple Sclerosis (MS) in their daily routines and enable them to participate in cultural activities. By helping provide social and intellectual stimulation, and bridging the gap between patients’ needs and physical abilities, participants will seek to support and inspire residents as they deal with the challenges of their condition while living full and meaningful lives. In many cultures and communities, we still experience discrimination of people with disability, especially when they get older. Working with people from different cultures as well as disability and different age groups will encourage participants to enhance their diversity competence and communication skills. By sharing of experiences from different countries, participants as well as patients will gain more knowledge and perspectives. Have a positive attitude and be stress tolerant. Be eager to help others. Be creative and entertaining - those who play music instruments, sing or dance are very welcome. 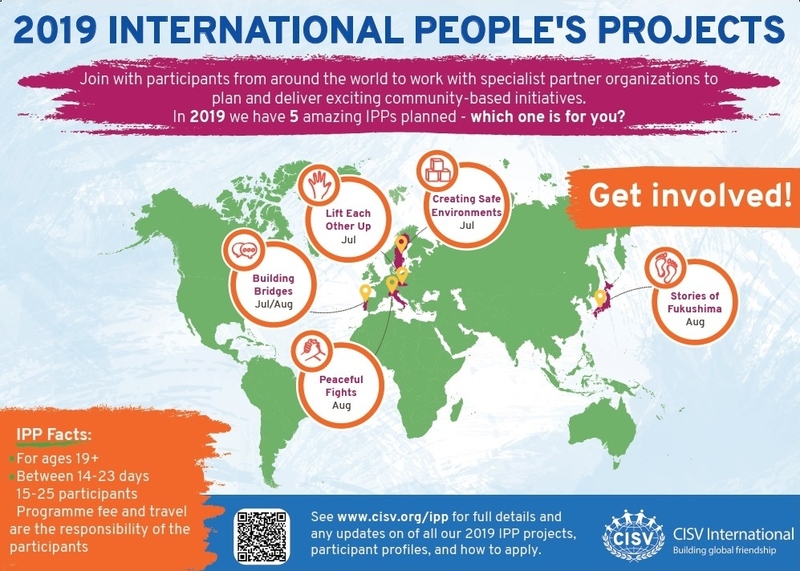 Contact your nearest CISV National Association and register your interest for IPP P-2019-001 Czech Republic This IPP is now FULL. Lisbon, Portugal. 26 July to 11 August 2019. Participants in this IPP will plan interactive activities with refugee youth, helping to foster their sense of community and empower them into action. They will support the development of attitudes, skills and knowledge that will enable them to reflect on the concepts of identity, culture and integration. By sharing CISVs approach to learning with the partner organizations staff, they hope to inspire and enable similar initiatives in the future. Casa de Acolhimento para Crianças Refugiadas (CACR) is affiliated with the Portuguese Refugee Council, and works with youth refugees (0-18 years) seeking asylum in Portugal. The work they do with these refugees is based on providing shelter while attempting to create a family environment. Integration into Portuguese society is promoted by enrolling the refugees in the public school system and community based activities. Participants will explore the themes of conflict induced population displacement. They will be exposed to and interact with different realities, backgrounds and languages. This IPP builds on work started through a local project in 2017 and aims to develop the relationship with the partner and further their goals. Be willing to interact in a diverse environment. Have a social empowerment attitude. Be able to communicate in multiple ways, where English is not a common language. Have experience working with the target group (ideal, but not mandatory). Be willing to explore the themes of culture, integration and identity and how they relate to their own experience. Torino, Italy. 4 to 18 August 2019. Participants in this IPP will work on a farm that has been confiscated from a mafia family, and given to a community cooperative, restoring it to public use. Through activities prepared by the partner organization, and visits to other local projects, participants will learn about how the modern white collar mafia works, and their place in a global network that is far from the old stereotype of the Italian godfather. Thriving in an unequal society, with interests in human trafficking and drugs, the mafia distorts the economic world, steal community resources and corrupting democracy. Libera (“Associations, names and numbers against mafias”), the partner organization, is a network of organizations committed to educating and encouraging civil society in the fight against organized crime and the promotion of law and justice. By visiting local projects, as well as sharing projects that are present in their countries to fight the local "mafias”, participants will be able to explore not only the problems, but also best practices around the peaceful fight of corruption. This IPP follows on from 2015’s “Freedom from all forms of the Mafia”, and 2017’s “Free Fields : A Focus on Equality and Democracy”. Be open minded and curious. Be interested in discovering the reality of the mafia, away from movie stereotypes. Fukishima, Japan. 11 to 24 August 2019. Through exploring the life after the Fukushima nuclear accident, this IPP will look at different stories—local and global life stories, stories of survival, post-disaster narratives, media rumours—in order to understand stigma and its challenges, as well as inspire actions for a more sustainable future. IPP participants will learn about the impact of the Fukushima nuclear accident in the community of Iitate village, the decontamination processes, rebuilding strategies and more importantly, the particular experiences of its residents. Participants will also learn from each other about stigma and post-disaster narratives from a global perspective. Participants will think about what kind of actions they can do together for the community, and implement them. The IPP will partner with “Fukushima Saisei No Kai” and “Sekiguchi Global Research Association.” Fukushima Saisei No Kai (“Resurrection of Fukushima”) aims to rebuild lives and reconstruct agriculture centred industries that have been affected by the accident at the Fukushima Daiichi Nuclear Power Plant in 2011. They have been working towards the revitalization of Iitate village since 2012 through collaborations between villagers, experts from universities and research institutes and local government representatives. SGRA (Sekiguchi Global Research Association, pronounced as “SEGRA”) aims to contribute to good global citizenship under the principle of harmony in diversity. SGRA has been organizing a study tour to Iitate village every year since the autumn of 2012, hosting workshops and forums based on the outcomes of these study tours. Some of the members will join this IPP as translators as well as facilitators. Thinking about the environmental and social wellbeing of Iitate village, participants will listen to volunteers and experts from the partner organizations, and visit the village to support some of the residents’ daily activities (gardening, farming, etc.). Participants will be able to meet (and possibly stay with) local residents, getting to know each other and sharing personal stories with each other. By going to this village, and having a first-hand experience about their life style and current challenges, we hope to reduce stigmatization, overcome prejudice, and raise awareness about social and environmental issues in relation to nuclear power. The IPP will inspire participants to take concrete actions as they will be given the chance to think about what they can do together based on their experience. For example, they may document this experience and spread the word to the world, or they may come up with new ways to transmit their acquired knowledge. At the end of the IPP, we will host an open “presentation day” in Iitate village, so that participants can share their outcome with the community. Have an interest in the Fukushima nuclear accident, and especially in learning about the life in Iitate village, Fukushima prefecture, Japan. Have a caring and positive attitude. Be willing to cooperate with others. Contact your nearest CISV National Association and register your interest for IPP P-2019-003 Japan. This IPP is now FULL. Download and share the 2019 IPP flyer and poster.